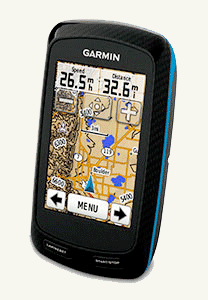 Many people have asked GORC how to add or convert GPS files and send them to their Garmin device that we decided to write our own universal tutorial. All those downloadable GPS tracks on Garmin, MapMyRide, EveryTrail, Strava, GPSies and beyond are usually saved as GPX files which stands for GPS Exchange Format. This format contains the tracking data of a particular track on a given day. It stores all the user's points and relevant information that can be later used to superimpose this data onto a map, stored for archival purposes or shared among other GPS users. Here's how to load a track of your friend's fastest lap ever around Matson Hill or wherever you are planning to ride with a GPS track. You can even "draw" your own track on many online mapping services, such as Google Earth, and export them as GPS tracks to use on your device. For older monochrome models, if you see a GPS track you want to follow on your Garmin device you will first need to convert it to a CRS file before sending it to your unit. To put a TCX or a GPX file on your newer, color Edge Series, you can transfer it to the Garmin using a simple drag-n-drop method. Every computer is different, but the general idea is that the Edge acts like a USB thumb drive. Plugging it into your computer should allow you to view the files stored on the unit. Once you have it plugged in, open up the drive associated with the GPS unit, then open the Garmin folder inside the drive. You'll now see a list of several files/folders. One of the folders is called NewFiles. You should copy (drag the icon) the file to this folder. Once done, safely remove the GPS unit. "Safely remove" means follow your systems instructions for removing a USB flash drive. Once the file is transferred to the Edge (500 and higher series) and is safely removed from the computer, power the device up. You should be able to find your route under the Courses menu. From there it should be fairly self explanatory. Go to Training--> Courses--> Select your course--> Select "Do Course"
The Course name listed on your Garmin device will be what the GPX data file is saved as ie, "Femme Osage Ride." If the Course on your desktop is renamed to "Cool Ride" and dragged to your GPS you would NOT find it under my Courses as "Cool Ride" but as "Femme Osage Ride" since that is what the internal GPX data contains as the file name. This is important for people who quickly create/find GPX files. If you make a quick and dirty GPX track on Google Earth or Maps and save it out the default name is always something like "2012-01-28T17:27:33Z" -- hardly a useful name. Be sure to name it something you will remember. Again, simply renaming the file to something you want does not change the Course name inside your Garmin device.